The commemoration of the Consecration of the revered house of our Most Holy Lady the Theotokos in Blachernae, in which the Holy Soros is kept, and the Forefeast of the Honorable Cross, namely the going forth from the imperial palace of the Honorable Cross throughout the City. Inhabitants celebrate for it brings protection to those in the City. Saint Joseph of Arimathea was accounted worthy to bury the immaculate body of our True God, Jesus Christ and, after the Lord’s glorious ascension into heaven, preached the Holy Gospel in many diverse lands. Of St Joseph’s early years little is known except that he was the son of wealthy and noble parents of the Old Covenant. 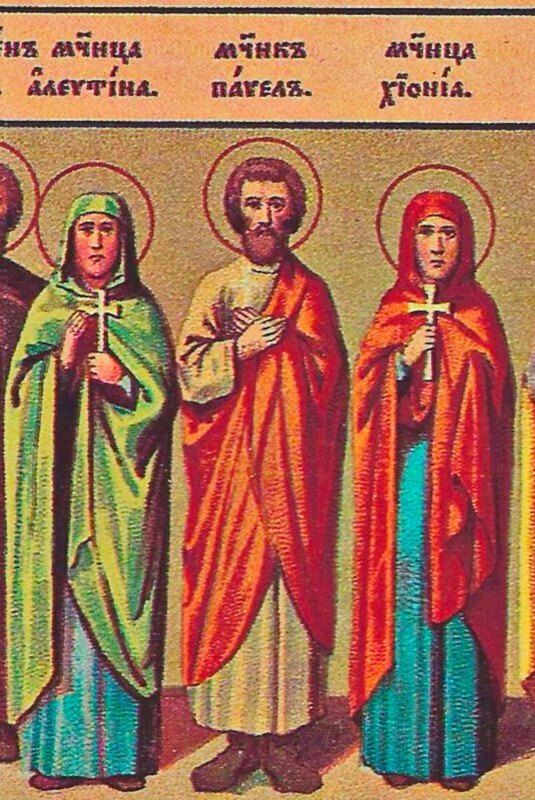 This pious family lived in the city of Ramah or Arimathea. As a youth Joseph was taught the sacred scriptures and knew well of what should come to pass when the Savior and Redeemer would come into the world as foretold by the Holy Prophets. As the God-loving Joseph grew, inspired by the Holy Spirit, he pondered on the prophecies. He considered the prophecy of the Holy Isaiah: "The Lord Himself shall give you a sign; Behold a virgin shall conceive and bear a son and shall call His name Immanuel" (Is.7:14). And the prophecy of Micah, "But you, Bethlehem, House of Ephratha, are little among the thousands of Judah, yet from you shall come forth to me Him who is to be ruler in Israel, and His going forth is from the beginning, from the days of eternity" (Mic.5:2). 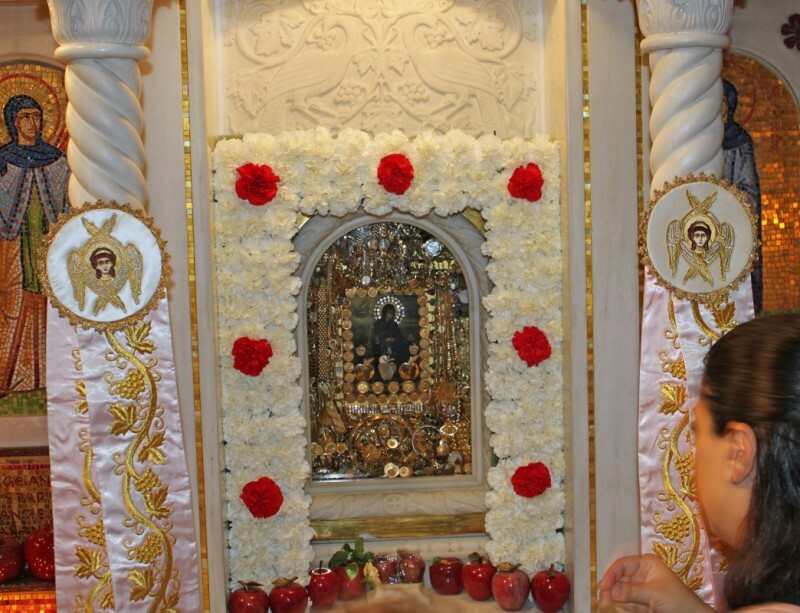 Though the relics of the Holy Apostle Philip for the most part were taken from Hieropolis to Rome, and they have fallen into relative obscurity in Rome, this is not the case on the island of Cyprus. 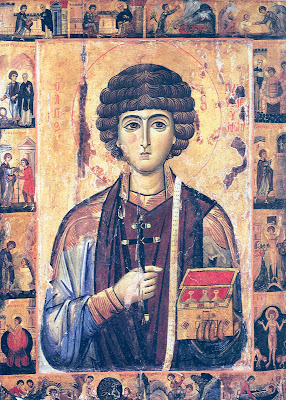 A portion of the skull of Saint Philip the reached Paphos, specifically the village of Arsos, following the fall of Constantinople to the Crusaders in 1204. It was transferred to Cyprus specifically on July 31, 1204, hence its annual feast day which is celebrated by the faithful till this day on July 31. 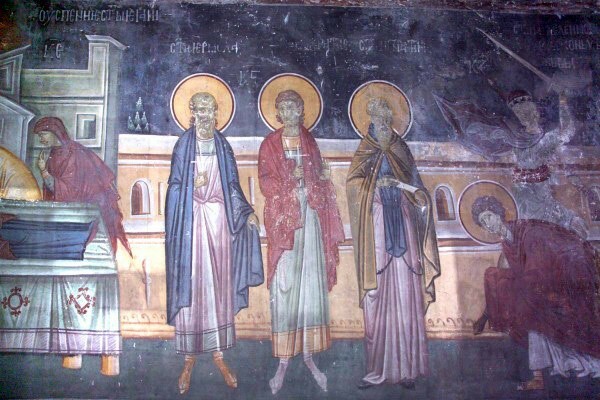 The Hieromartyr Bishop Valentine* and his three disciples, Proculus, Ephebus and Apollonius, and the righteous Abundius, lived during the third century. Saint Valentine was a bishop in Umbria (Italy), in the city of Interamna (Terni). He received from God the gift of healing various maladies. He cured the brother of the Roman tribune, Frontanus, of an illness. 13-14. And when the people had heard thereof, they followed Him on foot out of the cities. And Jesus went forth, and saw a great multitude, and was moved with compassion toward them, and He healed their sick. Constantine the president of the city of Constantine. Born in Kouzenas, in his youth Constantine studied in Constantinople, where he received a brilliant education. Constantine then entered into civil service and quickly built a career in the imperial court. He went on and directed state affairs as the mesazon (chief administrator) of emperors Michael V and Constantine IX, aided by a small circle of brilliant school friends who included John Mauropous, Michael Psellos and John Xiphilinos. He rose to high court offices: appointed protovestiarios (the Empire's senior-most financial official), he later became proedros (president) of the Senate. In 1050 Leichoudes' career was suddenly interrupted: he was deprived by Emperor Constantine IX of all titles and expelled from the capital. 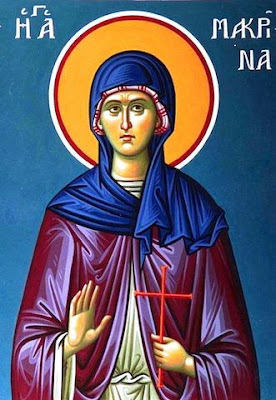 The only source from which we can gather information about St. Irene Chrysovalantou is her Life. We do not know who the author of this Life is, nor do we know when it was exactly written, and the original document has not been preserved. Swedish Byzantinist Jan Olof Rosenquist dates the original document to the last two decades of the tenth century. The text of the Life is known to us from seven surviving manuscripts, attributed to the 13th-17th centuries. The published text of the Life comes from the Acta Sanctorum, where it is titled "Vita S. Irenis hegumenae virginis Constantinopoli in Chrysobolanto, auctore anonym". 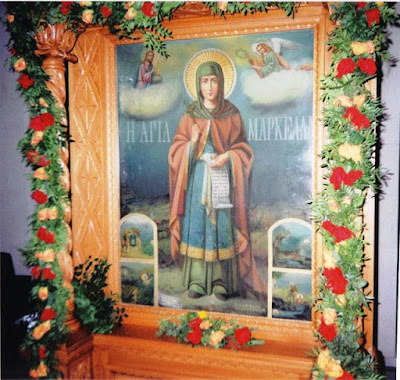 In churches and monasteries where St. Irene Chrysovalntou is celebrated, the following prayer is read before her icon over apples, after the apples have been processed and placed before her icon. This prayer sanctifies the apples and turns them into a source of blessing and healing by all those who partake of them with faith. Many thousands, after fasting and praying for three days, have partaken of these apples and have been the recipients of countless miracles of various illnesses and diseases, especially barren women. We do this in honor of the three apples from Paradise St. Irene herself received from an Angel of the Lord while she was abbess of the Monastery of Chrysovalantou in Constantinople. 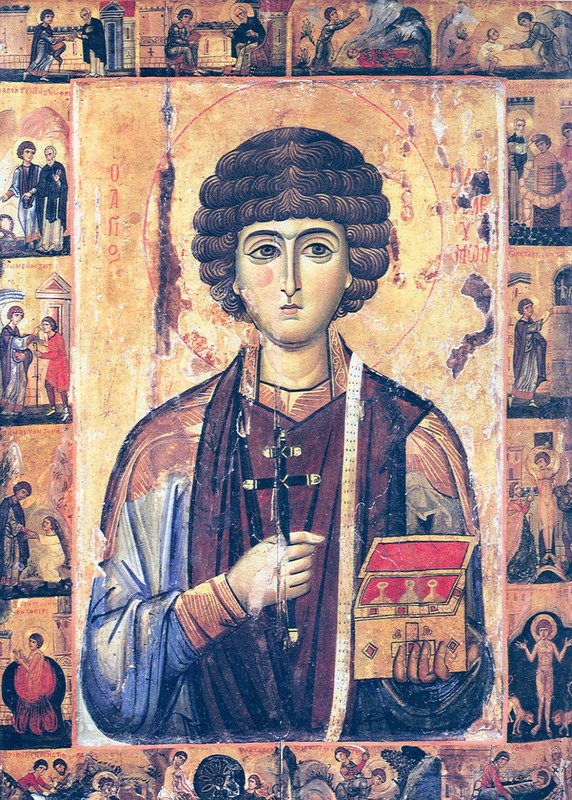 Following the martyrdom of Saint Panteleimon in 305, it is said blood mixed with milk flowed from his decapitated head, and this blood was collected by a pious lady of Nicomedia which she kept in her home. Apparently this blood displayed some unusual activity, since a tradition says merchants from Amalfi in Italy heard of it and journeyed to Nicomedia to obtain it. A portion of his blood however was treasured at Constantinople, brought from Nicomedia probably in the tenth century, where one year the blood would come to the surface and the next year the milk. Once during the reign of Emperor Michael Palaiologos (1259-1282), the blood came up and it turned out to be a year of battles. The blood that was taken by the merchants from Amalfi was brought to Ravello, 22 miles from Naples, where records from 1112 reveal that the blood was kept there in the Cathedral of Saint Pantaleon (in the West Saint Panteleimon is known as Saint Pantaleon). - Elder, I'm sick. Say a prayer that I may become well. - It will not be good for you for me to pray about this matter. If you are patient and have faith in God, then you will get a pension from "healthcare", which is bigger than the Agricultural Insurance Organization! The Church of Saint Panteleimon at Acharnanon is a Greek Orthodox basilica in the center of Athens on Acharnon Avenue. 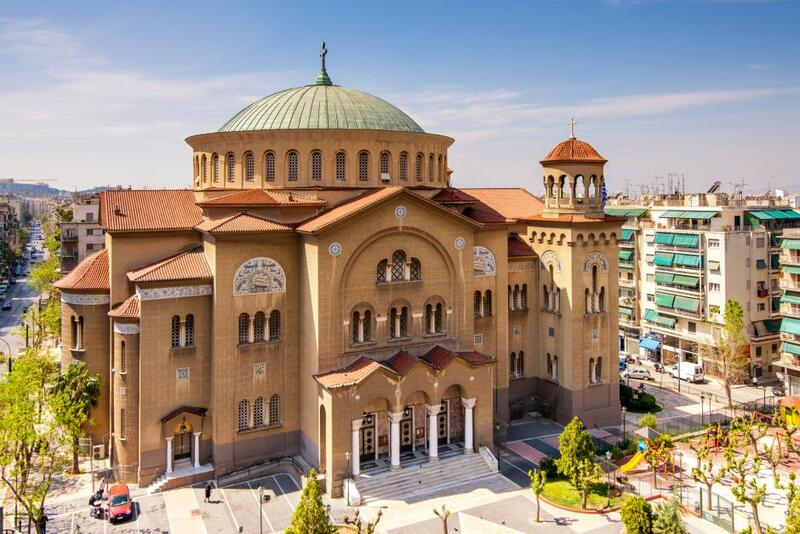 It is the largest church in Athens, the third largest in Greece, and the eighth largest Orthodox church in the world, with a capacity of 10,000 people. The dome is only two meters smaller than the dome of Hagia Sophia in Istanbul, occupying an area of 1600 m. The thickness of the masonry of the temple reaches two meters. The Monastery of Saint Paraskevi, which stands on a hillside in the village of Kinopiastes in Kerkyra, was established in 1571. The original monastery stood about a hundred meters from where the monastery is today. 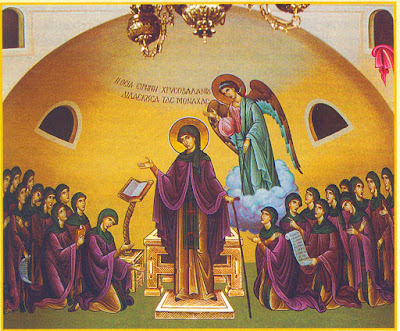 In the beginning the monastery was for men, but today it is a monastery for women. On the plaque of the monastery it says the year 1833, which is the year the monastery was restored by Monk Christopher Mazarakis, who also brought a relic of Saint Joseph the Sanctified. The Monastery of Saint Anthimos and Saint Paraskevi in Lepeda of Kefallonia is a female monastery that unfortunately is empty today following the death of the nun Hermioni, who served here for almost a century. 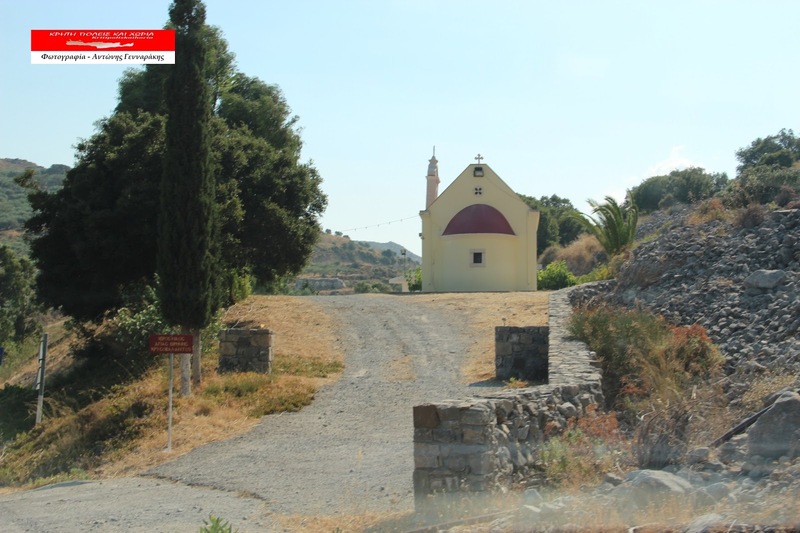 It was established in 1568 as a male monastery, with Laurentios Mantzavinos being the first abbot. 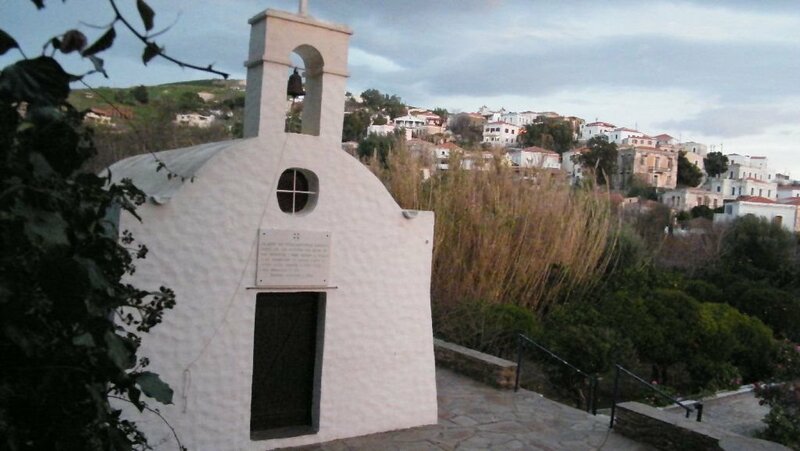 He along with other monks built the entrance to the cave, where they found the Holy Water of Saint Paraskevi. There they built a church and dedicated it to the miraculous Saint, when Timothy Tipaldos was the archbishop. Who gushes forth a spring of miracles for all. 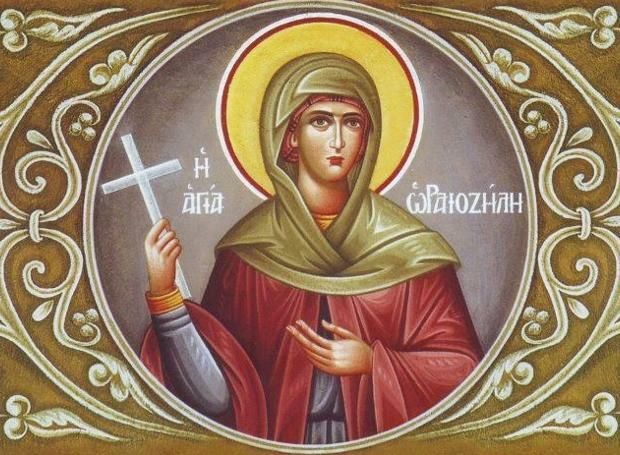 Saint Oraiozele lived in the first century, though nothing is known of where she was born or her youth. All we know is that her parents were Greek pagans who worshiped idols. It happened that one day she heard the Apostle Andrew preaching the gospel, and by his message she was moved to forsake paganism and embrace the faith of Christ. Thus around the year 52 she was baptized by the Apostle Andrew. You boldly shamed those who revered Hermes. On the twenty-sixth Hermolaos was beheaded. Indicates their common end by the sword. On the twenty-sixth Hermolaos was cut at the neck by a sword. Though today there are twenty monasteries in the area of Mount Athos, at one time there were many more. Among these was Vouleutirion Monastery which, as the name indicates, was a place of gathering and decision making for the monastics of Mount Athos when the monasteries there were first established in the tenth century. 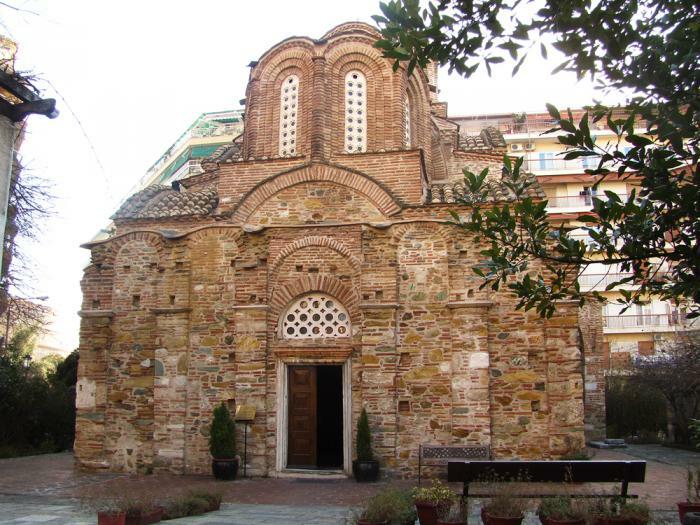 It was placed under the supervision of Saint Athanasios the Athonite and the Great Lavra Monastery by the Roman Emperor Nikephoros Phokas at around 960. 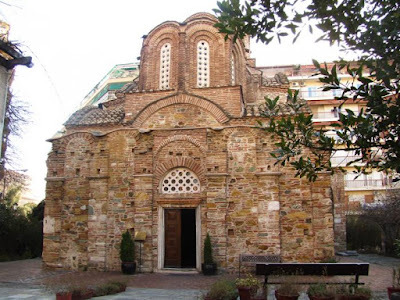 It was situated on the southwest side of Mount Athos, on a steep, lush slope at the foot of where Saint Anna's Skete is today, near the shore. Because it was near the shore, in the year 1302 Catalan Spaniards destroyed the monastery in a raid. Today the Hermitage of Saint Eleutherios - Vouleutirion exists where the monastery once stood. It was established in 1769 over the foundations of the previous monastery and remains today under the supervision of Great Lavra Monastery. 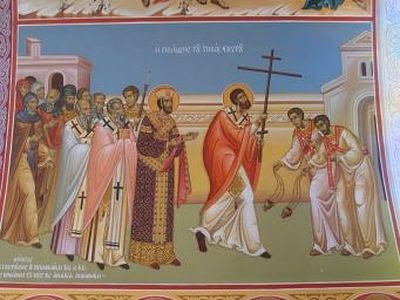 The enmity of the clergy against John [Chrysostom] was greatly increased by Serapion, his archdeacon. He was an Egyptian, naturally prone to anger, and always ready to insult his opponents. The feelings of hostility were further fostered by the counsel which Olympia received from John. 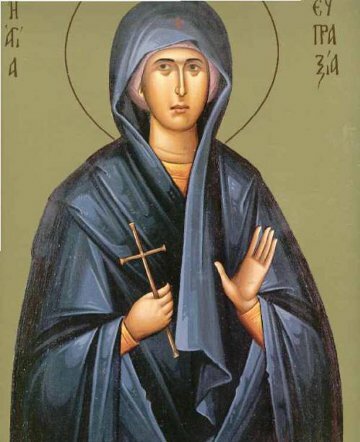 Olympia was of most illustrious birth, and although she had become a widow while young, and was zealously attached to the exercises of monastic philosophy according to the laws of the Church, yet Nektarios had ordained her as deaconess. 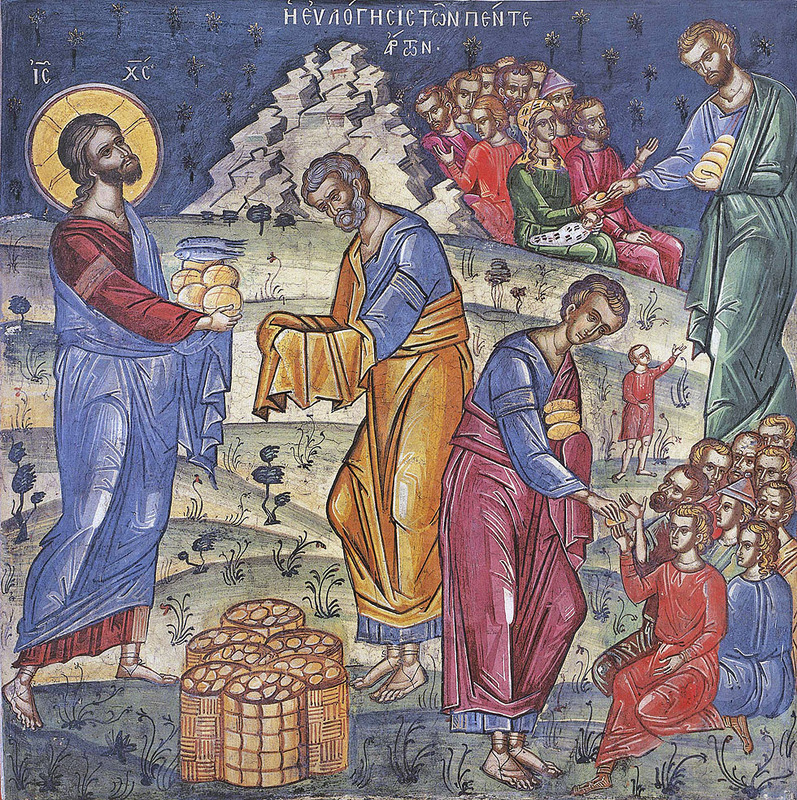 John, perceiving that she bestowed her goods liberally on anyone who asked her for them, and that she despised everything but the service of God, said to her: "I applaud your intentions; but would have you know that those who aspire to the perfection of virtue according to God, ought to distribute their wealth with economy. You, however, have been bestowing wealth on the wealthy, which is as useless as if you had cast it into the sea. Know you not that you have voluntarily, for the sake of God, devoted all your possessions to the relief of the poor. You ought, therefore, to regard your wealth as belonging to your Master, and to remember that you have to account for its distribution. If you will be persuaded by me, you will in future regulate your donations according to the wants of those who solicit relief. You will thus be enabled to extend the sphere of your benevolence, and your mercy and most zealous care will receive reward from God." Having tended to many good works of the soul. Saint Eupraxia was the daughter of her father Antigonus the senator, and her mother was Eupraxia, who flourished during the reign of Theodosius the Great (379-395), with whom she was related. When her father died, her mother gave her over to Emperor Theodosius, begging him to take care of her orphan daughter. Theodosius had Eupraxia engaged to a leading senator. After this the Saint withdrew together with her mother and they went to Thebes in Egypt. There she entered a female monastery, where one hundred and four nuns lived in asceticism, who conducted their lives as equal to the angels. There Eupraxia entered, imitating their virtues, and from that time she did not leave the monastery; she was twelve years old at the time. Miltiadis Angelis (known as Meletis in Steni) had married Maria Beligianni (known as Mario in Steni). They had many children, but only five survived till their old age - Kosta, who died in America unmarried; Stella, who married Apostolis Beligianni (who was so-called landless, fat or rich); Spyro, who married Panagiota Gatou (Poula); Giagkos, who married Kalliopi Apostolidou from Avlonari; Odysseus, who did not have a family. 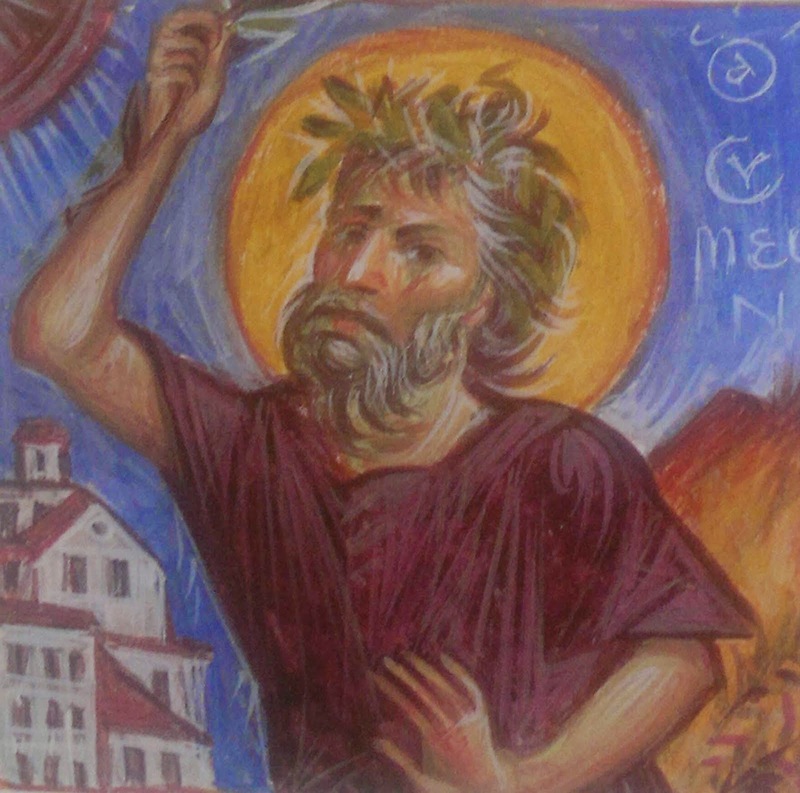 Meletis was a shepherd who kept his sheep in Steni during the summer and in Halia (now known as Drosia in the region of Soros) during the winter. When we were in the guesthouse at Ascalon, Abba Eusebius, a presbyter, told us of a ship-owning businessman who lost all his goods and that of others he was carrying at sea, though he himself escaped from the shipwreck. 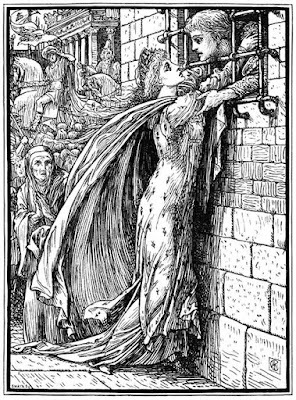 When he came back to Ascalon his creditors seized him, threw him into prison and took possession of everything in his house, even his wife's clothing. She was greatly distressed, and worried that in her poverty she was unable to provide any food for her husband. She was sitting in tears in the prison one day when a rather important looking man came in giving alms to the prisoners. When he saw this free woman sitting with her husband he fell in love with her, for she was very beautiful, and told her to leave the prison and come with him. She thought that he was going to give her something, so she freely did as she was told. 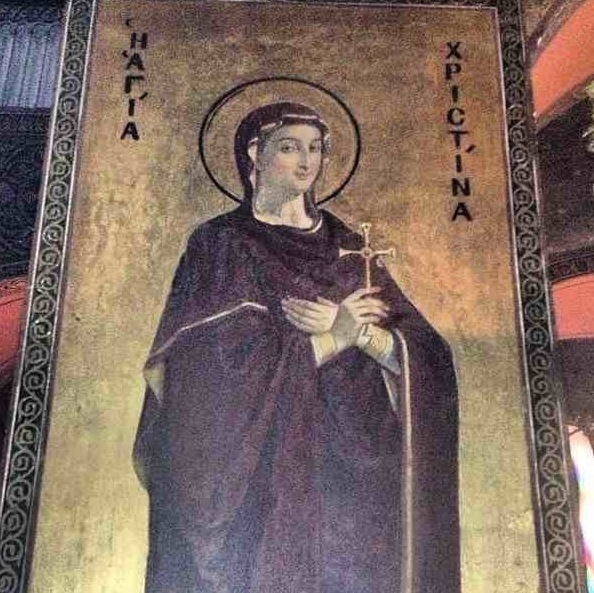 Saint Christina was born in Tyre around the year 200. Her parents were both pagan idolaters, with her father being a general in the Roman army whose name was Urbanus. A pious woman catechized her in the truth of the Christian faith. From the moment she became a member of the Church her life changed and she lived within the love of God and in service to others. 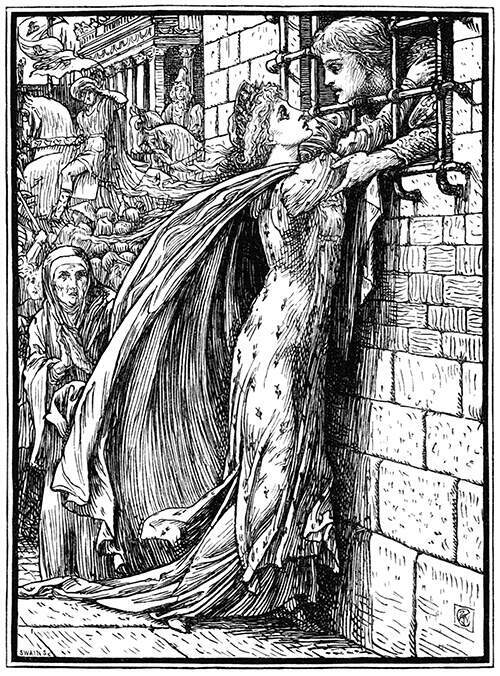 It was not long after that her father was informed that his daughter became a Christian, and in a rage he shut her up in a tower and tried by every means to persuade her to return to idolatry. Because she remained firm in her faith, he had her imprisoned. After her father died, the eparch Dion had her horribly tortured. 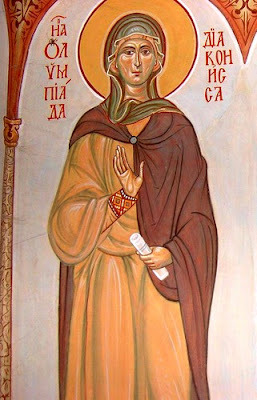 Then the eparch Julian cast her in a place of wild beasts and fierce snakes, but the Saint remained unharmed, since the irrational beasts, as opposed to the rational ones, respected her. When many pagans had seen that the Saint remained unharmed after her horrible tortures, the wild beasts and the fierce snakes, they believed in Christ and boldly confessed their faith. 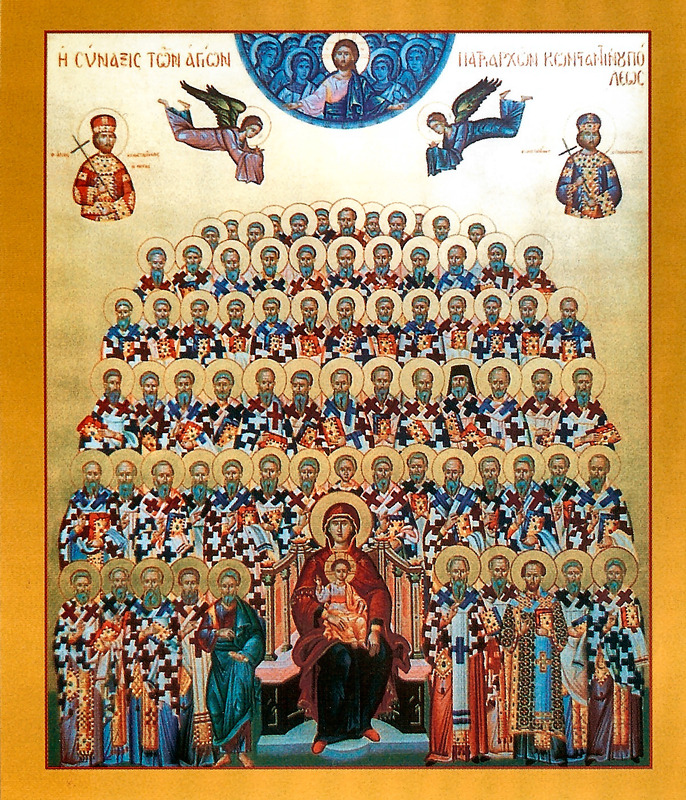 Then the eparch ordered for all of them to be killed, and in this way they received the unfading crown of martyrdom. Saint Christina delivered her pure and untainted soul into the hands of the living God, when a spear was driven through her side and heart. 1. 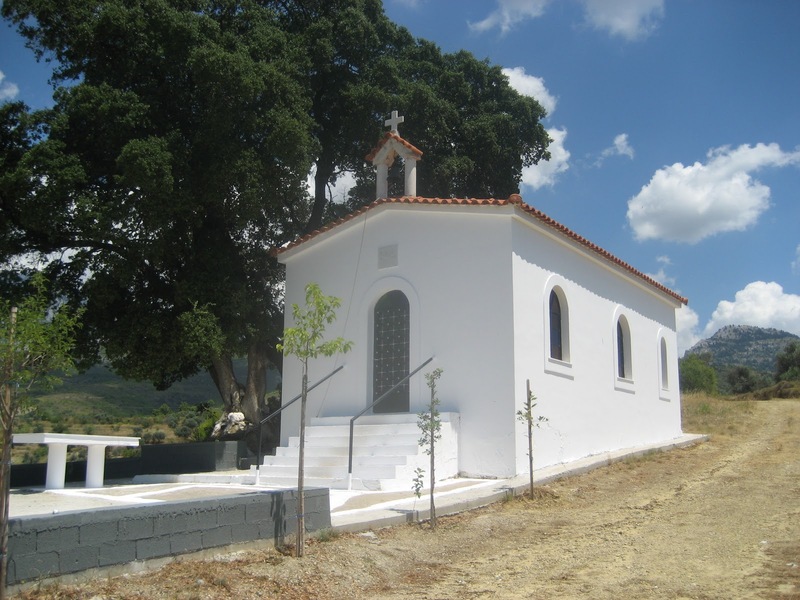 Chapel of Saint Christina in the region of Thrakiotika - Nea Zoe of Katerini. 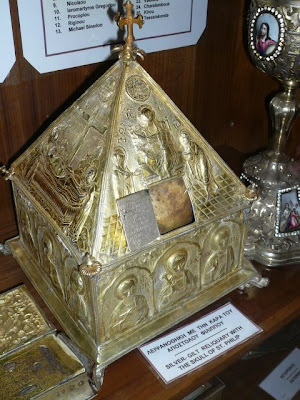 Photo shows a portion of the relic of St. Christina from the nearby Church of Saints Christopher and Euthymios. 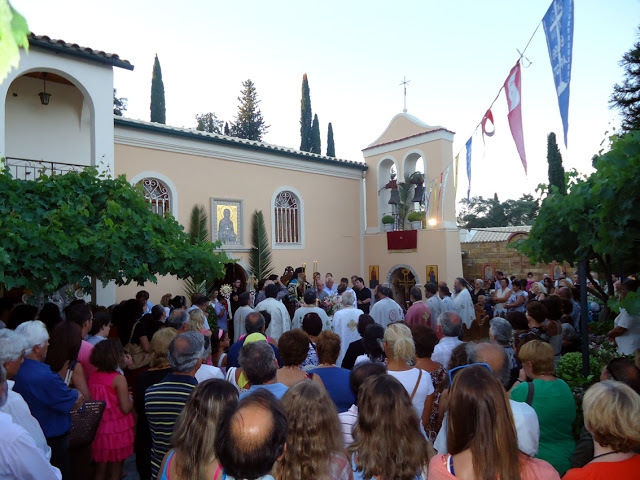 It is from this parish that there is a procession every July 24th in honor of St. Christina to her chapel. 27. And when Jesus departed thence, two blind men followed Him, crying, and saying, "Thou Son of David, have mercy on us." 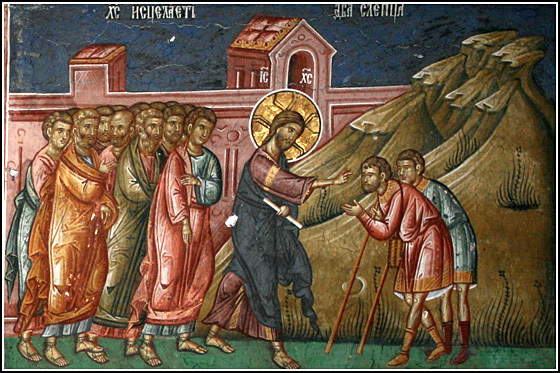 The blind men addressed to God the words "have mercy," but as to a man, "O Son of David." For it was well known among the Jews that the Messiah would come from the seed of David. 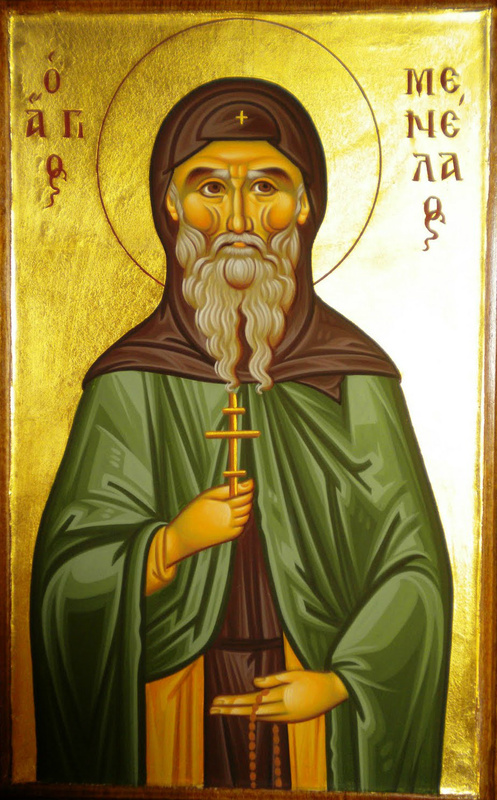 Saint Menelaos was born in Precigne of France around the year 700 and came from a very eminent aristocratic family. 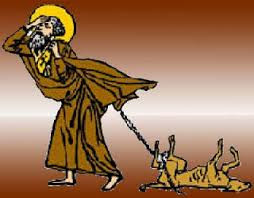 From very early age it was foreboded that the Saint would follow the road that Jesus had shown. That led to many obstacles, difficulties and challenges, as his father, when the Saint reached manhood, pushed him to get the official social position as a prince and get married to a blueblood. The young man Menelaos replied without fear that he did not want to get married. And because of continuous conflict with his father, he finally decided with a broken heart to flee those worldly plans. 1. 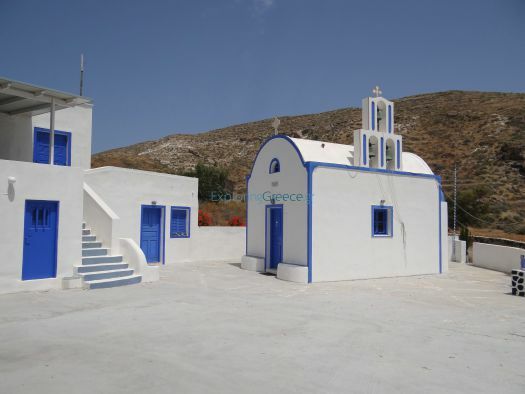 Chapel of Saint Markella in Akrotiri of Santorini. Little is known of the early life of St. Mary. 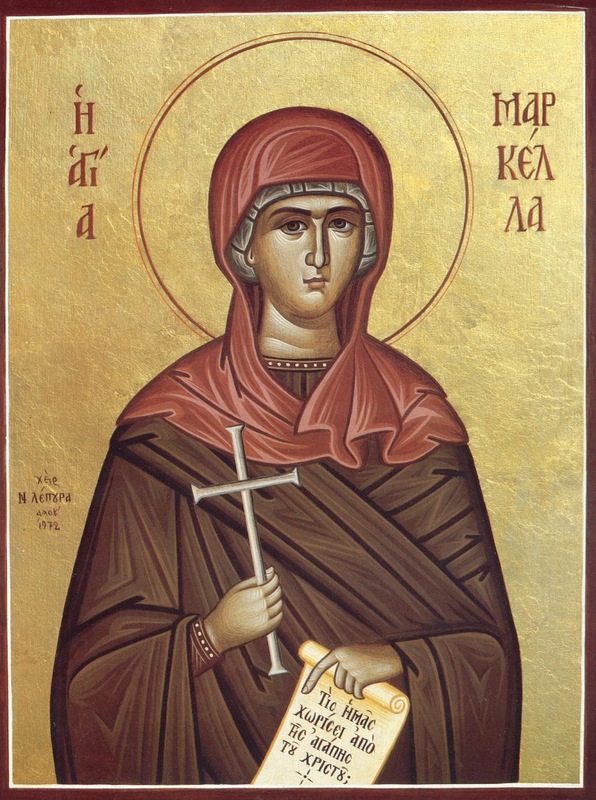 She was called "Magdalene" because she lived in the town of Magdala on the shore of the sea of Galilee. In the Gospels we read that she was afflicted with an incurable disease: she was possessed by seven devils (Lk. 8:2). This was allowed by God's Providence so that in curing her the Lord Jesus Christ could show forth the power and glory of God. 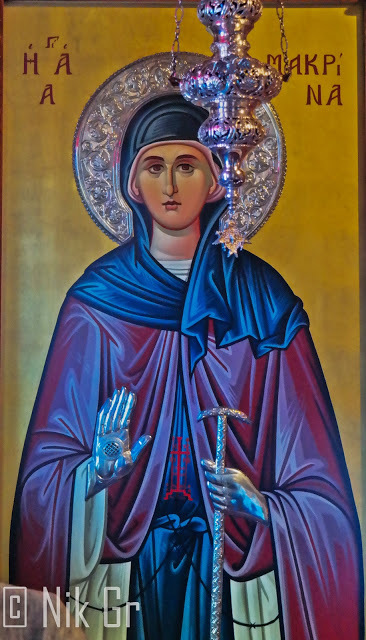 O spotless bride of the Lord, Markella, as another spring of Siloam, your Bridegroom showed forth the rock that was rent and received your holy relic, which gladdened God, and those who approach this with faith are saved. Here it is not the first one who is healed, but all are. An angel does not come to trouble the waters, but it is your presence. Also heal, therefore, my soul and body, who have come last instead of first, through fear of offenses (thrice). You, therefore, O all-blessed Markella, who appear as an awesome sight to behold, in compassion grant us to drink of the water from your spring, we who are approaching death, and lift us out through your hand by this water. For you again said to the woman: "I sent you your healing", and the next day, through your water, she received deliverance of her affliction. The Rev. Sabine Baring-Gould (28 January 1834 – 2 January 1924) of Lew Trenchard in Devon, England, was an Anglican priest, hagiographer, antiquarian, novelist, folk song collector and eclectic scholar. 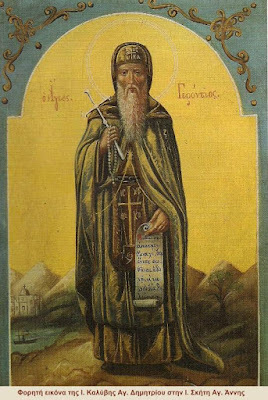 Despite his broad range of knowledge, often dealing with and writing about strange things, it is interesting how offended he is by the life of Saint Symeon Salos, more popularly known as Saint Symeon the Fool for Christ. The text below comes from his book Curiosities of Olden Times under the chapter titled "Some Crazy Saints", written in 1896. By the Rev. Sabine Baring-Gould, M.A. 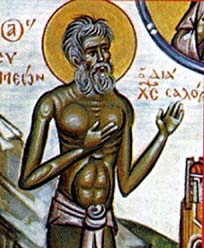 In the modern Roman Martyrology we find on July 1 St. Symeon Salos given as a confessor, approved by Rome as a model for Christians to take example by. 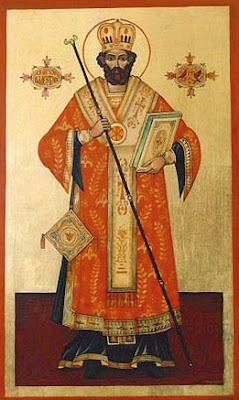 M. Wratislaw has lately drawn attention to St. John Nepomucene, and has shown how careless Rome has been in her assertions about the circumstances and the date of his martyrdom. 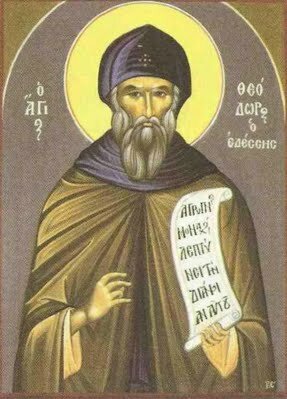 The case of St. Symeon Salos also deserves attention. 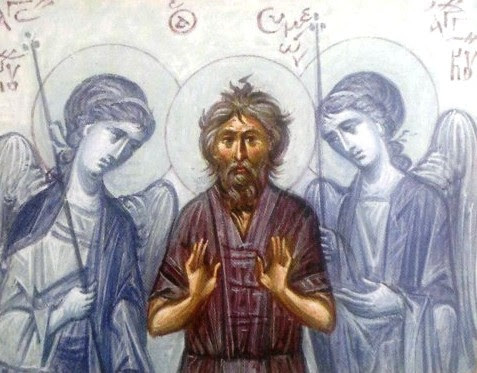 After [Symeon and John] had spent twenty-nine years in the desert practicing every asceticism and mortification, in cold and in heat, enduring many and unutterable temptations from the Devil and conquering them, and had arrived at a high level of virtue—especially Symeon, who, because of his being innocent and very pure on account of the power of the Holy Spirit dwelling within him, perceived himself fearing neither suffering, nor cold, nor hunger, nor burning heat, but rather nearly exceeded the limit of human nature—he said to John, “What more benefit do we derive, brother, from passing time in this desert? But if you hear me, get up, let us depart; let us save others. For as we are, we do not benefit anyone except ourselves, and have not brought anyone else to salvation.” And he began to quote to him from the Holy Scripture such things as “Let no one seek his own good, but rather the good of his neighbor” [1 Cor 10:24], and again, “I have become all things to all men, that I might save all” [1 Cor 9:22], and from the Gospel, “Let your light so shine before men, that they may see your good works and give glory to your Father who is in heaven” [Mt 5:16], and other such things. And lord John answered him, “I think, brother, that Satan is jealous of our silence and suggested this thought to you. On the contrary, sit down and let us complete our course in this desert, where we began and where we were called by God.” Symeon said to him, “Believe me, I won’t stay, but I will go in the power of Christ; I will mock the world.” Again his brother said to him, “No, good brother, please, for the Lord’s sake, do not leave wretched me. For I have not yet reached this level, so that I can mock the world. Rather for the sake of Him who joined us, do not wish to be parted from your brother. You know that, after God, I have no one except you, my brother, but I renounced all and was bound to you, and now you wish to leave me in the desert, as in an open sea. Remember that day when we drew lots and went down to lord Nikon, that we agreed not to be separated from each other. Remember the fearful hour when we were clothed in the holy habit, and we two were as one soul, so that all were astonished at our love. Don’t forget the words of the great monk, with which he advised us on the night we left. Please don’t, lest I die and God demands an account of my soul from you.” Again Symeon said to him, “Think of me as dead. Wouldn’t you have to think about being alone by yourself? Believe me, if you come, it would be well and good, since I myself am not staying.” When brother John saw that he was persistent, he knew that he had been convinced by God to do this, since nothing would separate them except death, and perhaps not even that. For they had often prayed to God, that he would take the two of them together, and they knew that the Lord heard them in this as in all things. 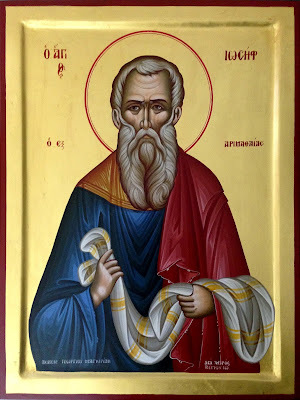 There lived also at Emessa, Symeon, a man who had so completely unclothed himself of vainglory as to appear insane to those who did not know him, although filled with all wisdom and divine grace. This Symeon lived principally in solitude, affording to none the means of knowing how and when he propitiated the Deity, nor his time of abstinence or eating. Frequently, too, on the public roads, he seemed to be deprived of self-possession, and to become utterly void of sense and intelligence, and entering at times into a tavern, he would eat, when he happened to be hungry, whatever food was within his reach. But if any one saluted him with an inclination of the head, he would leave the place angrily and hastily, through reluctance that his peculiar virtues should be detected by many persons. Such was the conduct of Symeon in public. Your end utterly escaping the notice of the sensible serpent. Wretched men are apt to censure the writings of the Old Testament saying: "How was it just for blessed Elijah to burn two captains with their soldiers by means of fire brought down from heaven?" How justly and mercifully this was done, dearly beloved, we want to indicate briefly to your hearts. In the days of the Old Testament, any crimes or offenses committed among the people were ordered to be physically punished. Thus it is written: "Eye for eye, tooth for tooth." Indeed, some were punished in order that the rest might fear bodily punishment and refrain from sins and offenses. Now, in the time of the prophet, all the Jewish people had abandoned God and were sacrificing to idols, not only refusing to honor God's prophets but even very frequently trying to kill them. For this reason blessed Elijah was aroused with zeal for God and caused some to be punished physically, so that those who had neglected the salvation of their souls might be healed in heart by fearing bodily death. We should consider that not so much blessed Elijah as the Holy Spirit did this. 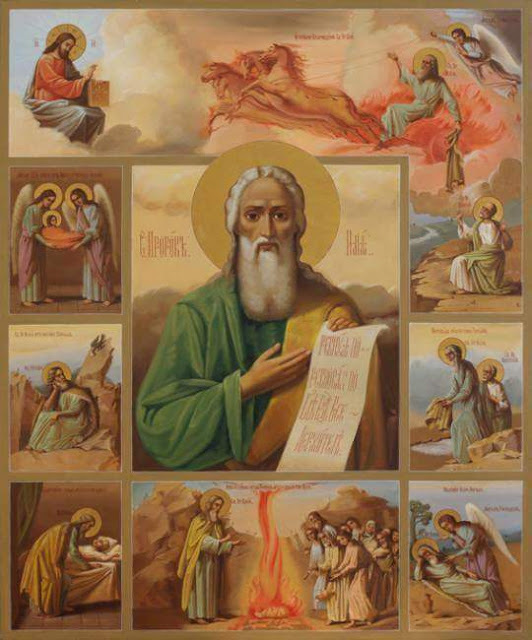 In the ranks of the Old Testament prophets, a special position is occupied by the Prophet Elijah, whose sacred memory the Church honors and celebrates today. In the New Testament, the name of the Prophet Elijah is frequently mentioned by Christ Himself. 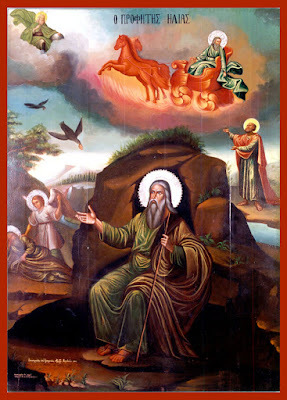 Zechariah, the father of the Forerunner, said that John would come “in the spirit and power of Elijah”, that is, that he would have the features and the zeal of the Prophet Elijah, that he would be the Prophet Elijah himself, whose return the people were awaiting. When Jesus bore witness to John the Baptist and praised him highly, He said that he was Elijah: “If you want, accept that he is Elijah who was to come”. From the world and approached the Lord. You dwell with them on high fraternally also. On the nineteenth Angels took Macrina hence. 1. Portion of the foot is at the Athonite Monastery of Iveron. As one who is great you gave much to Edessa. Our Holy Father Theodore was born in the Mesopotamian city of Edessa and lived during the ninth century. His parents, Symeon and Maria, who were pious Christians, had given birth to a daughter but also desired a son, for which they prayed. One night both had the same vision of Saints Theodore and Paul the Apostle, telling them that they would indeed be granted a son. At the age of two he was baptized by the Archbishop and given the name Theodore, which means "gift of God." At the age of five, his parents began his schooling, but he had great difficulty grasping his lessons, and for this his parents reproached him, and his teacher even struck him. 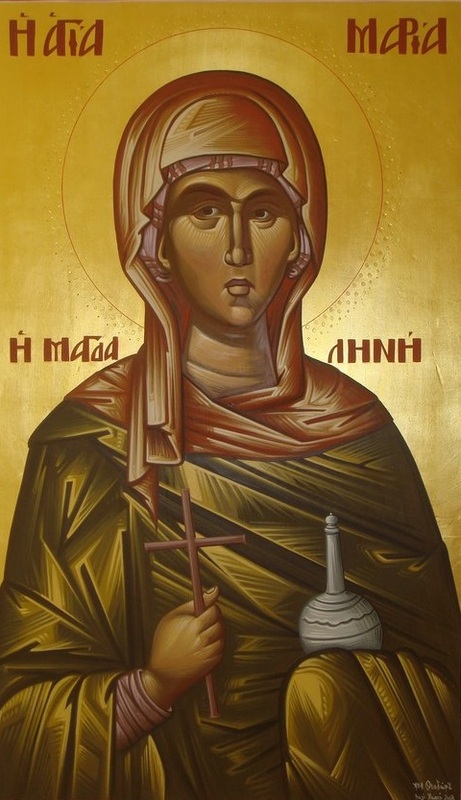 The Life of Saint Macrina, written sometime between A.D. 380 and 383 by her younger brother Gregory of Nyssa, is the story of a remarkable woman and a remarkable ­family. 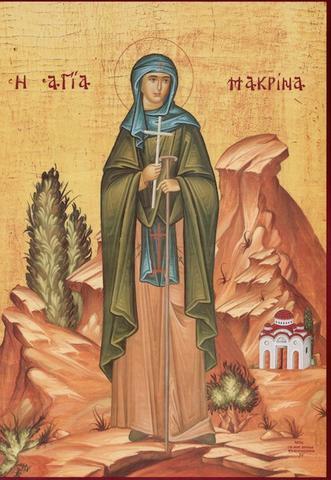 Gregory wrote two works about Macrina (together referred to as Ta Makrinia, "The Macrina Works"), the Life and a Dialogue on the Soul and the Resurrection. 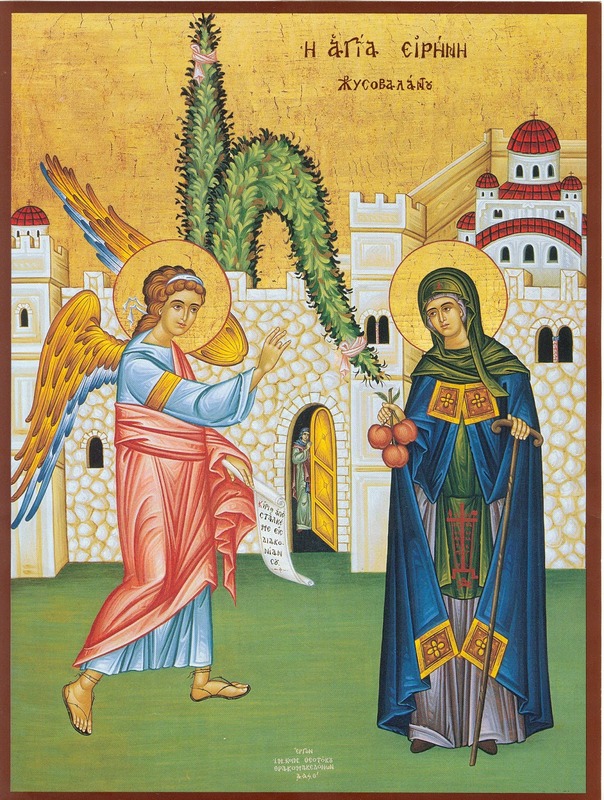 The two works are independent, but they refer to one another and should be read together, since the Dialogue is in fact the long conversation Macrina had with Gregory upon his arrival at the monastery. Behind the personal tribute in these works there lies a deeper typology at work: Macrina is the virgin-philosopher par excellence, and although Gregory wants us to see the type, or deeper imprint of tradition in her, the type which Macrina embodies is nonetheless unique. In the Life Macrina is presented as a ­second Thekla, the legendary virgin who, in the apocryphal Acts of Paul and Thekla, is the faithful disciple to whom St. Paul entrusts the continuation of his apostolic ministry. 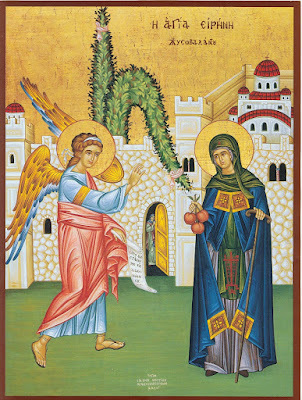 This traditional continuity Gregory intimates not only in the dream which his mother Em­melia has when she is in labour with Macrina, but in his insistence that Macrina is a teacher, a leader and a mistress of Scripture. Her incomparably beautiful deathbed prayer bears witness to the fact that Holy Scripture permeated her every word. In the Dialogue (so reminiscent of Socrates' death bed scene and his arguments for the immortality of the soul in the Phaedo), Macrina is presented as the Christian Socrates, equal to, or even surpassing, that profound intelligence. The Socratic typology also enters into the Life, both in the "ideal of philosophy" which is central to Macrina's life and also in the dramatic fibre of the whole work, centred upon the deathbed of a mighty religious and intellectual leader. The idea of putting the two figures, Thekla and Socrates, together might have been suggested to Gregory by a work written in the second half of the third century, the Symposium of Methodius of Olympus (after Plato's famous Socratic dialogue of the same name) in which a group of ten women, whose intellectual leader is Thekla, discuss the theme of virginity at a banquet, instead of love (eros) as in Plato's Symposium. In the Life and the Dialogue, however, Gregory weaves these two themes together in such a natural way within the figure of Macrina that there is nothing procrustean or out of place about the union. 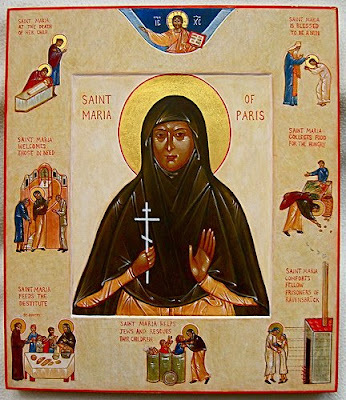 Furthermore, the ideal of philo­sophy itself is so central to Macrina's monastic life that we undoubtedly hear the ­original phrases when the soldier tells of St. Peter's pressing invitation to take part in "the philosophic table". 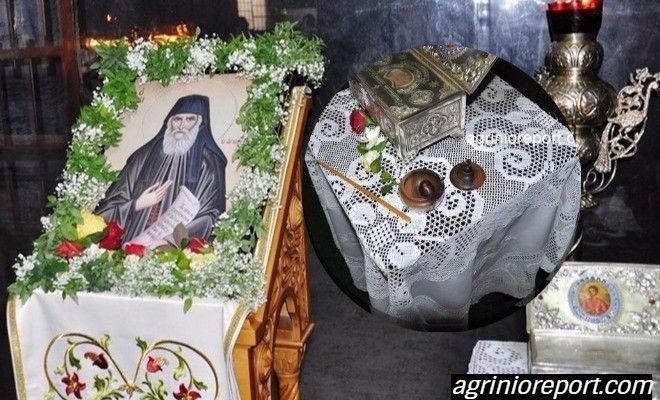 Over the past few days a story has gone viral among Greeks about Saint Paisios the Athonite that boggles the mind for its silliness, over a chestnut given as a blessing from Saint Paisios to a student 27 years ago that was briefly displayed during the vigil in honor of Saint Paisios on his feast day on July 11th. Cynics and scoffers who heard about it were not at a loss of jokes about this, and accused the Church of Saint Demetrios in Agrinio, where this took place, of exposing objects as insignificant as a chestnut given by Saint Paisios to be an object of veneration by "mindless" devotees of the Saint. One article even had the lame title "Twitter Had a 'Party' With the Chestnut of Paisios", to show how the mockery and ridicule went viral on Twitter. 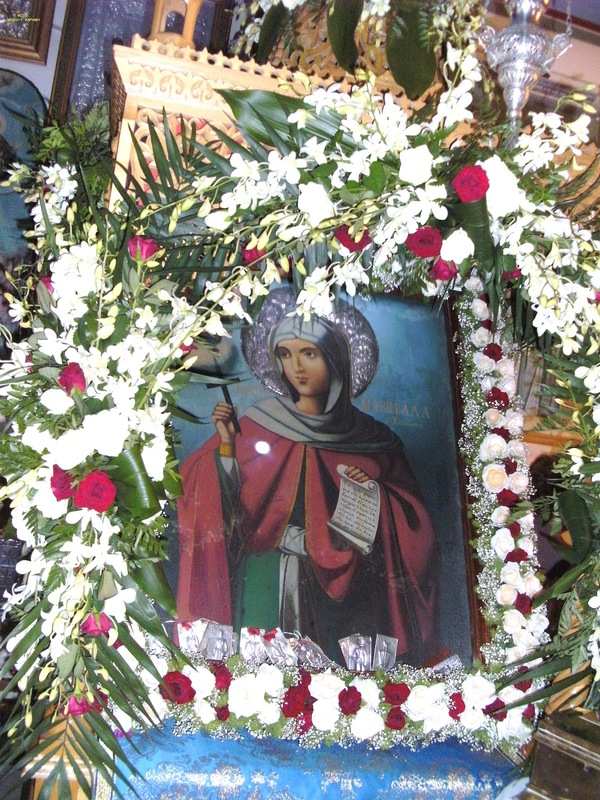 Even the English version of Ekathimerini published an article titled "Para-religious Fetishism" that used this story as an opportunity to criticize the canonization of Saint Paisios and his veneration. But not by faith, therefore you were beheaded by the sword. For enemies of God thrash you, out of the enmity of their error. In the Sixth Year of the Persecution of our Days (A.D. 308). Up to the sixth year of the persecution which was in our days, the storm which had been raised against us was still raging; and great multitudes of confessors were in the mines which are called Porphyrites, in the country of Thebais, which is on one side of Egypt; and on account of the purple marble which is in that land, the name of Porphyrites has also been given to those who were employed in cutting it. 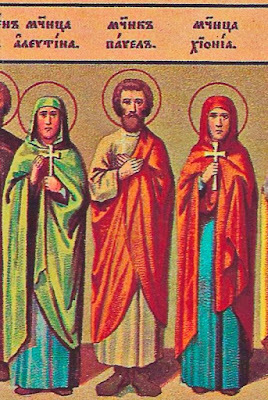 This name, therefore, was also extended to those great multitudes of confessors who were under sentence of condemnation in the whole of the land of Egypt, for there were a hundred martyrs there all but three. And these confessors were sent, the men together with the women and children, to the governor in Palestine, whose name was Firmillianus. For he had superseded the governor Urbanus in his office, and he was a man by no means of a peaceful turn; indeed he even surpassed his predecessor in ferocity, having been a soldier that had been engaged in war, and had had much experience in blood and fighting.